The vision for the Meaford Haven Community Centre got a little more focused recently. We got quite a mixed response from the first round of the virtual focus group that discussed the community centre for our Ontario retirement community. So we refined the questions and begged the indulgence of future residents of the retirement community – and we got some clearer answers. A fitness facility with group classes found favour with voters, and a swimming pool is definitely desired. Imagine this… an indoor, salt-water pool that can be used round. In the winter, you enjoy a refreshing and invigorating swim with a beautiful view of snow draped trees and grounds. As the weather warms, presto – the pool is opened to the sun-warmed, landscaped patio, and the indoor pool is outdoors. The clubhouse atmosphere favoured by most is something not too stuffy, but definitely not drab, either. Something comfortable, like a combination café and pub, seemed to be the preference. And we also got votes for such additional amenities as a kitchen, office space, a library, and a comfortable indoor mailroom rather than outdoor area mailboxes. For full details, visit here. 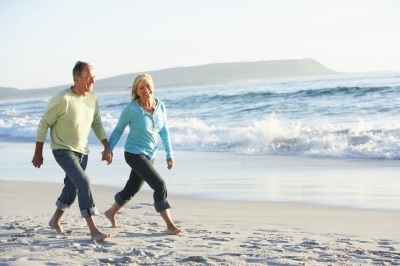 Your small-town Ontario retirement – Can you retire mortgage free? Forty-seven percent of Ontarians expect to still be paying for a mortgage into their retirement years, according to a study released by BMO Financial Group last week. This despite the fact that retiring mortgage free not only makes for a more enjoyable lifestyle – it’s a smart financial move. “If your retirement is only a few years away, it’s wise to try and pay off your mortgage before you enter retirement,” says Laura Parsons, Mortgage Expert, BMO Bank of Montreal. This is due to the simple fact that less employment income means less money to manage your debt load, says Tina Di Vito, Head, BMO Retirement Institute. Strategies include choosing a shorter amortization or switching to bi-weekly payments – both of which mean paying a little more down and decreasing the ensuing debt years down the road. But in the years immediately before retirement these options may not be the most effective choices; there simply isn’t enough time to make a significant dent. Fortunately, there is another way to retire mortgage free. If you’re living in one of Ontario’s real estate hotspots, you likely have substantial equity in your home, even if you are still carrying a mortgage. That equity will go a long way in many Ontario small towns, including some of the most beautiful in the province. This might mean downsizing a little – but maybe not as much as you think. Moving from a four-bedroom home in the GTA to a condo in the same community to save money will mean settling for a much smaller place, as real estate values will be comparable. But you’ll find a small-town Ontario retirement community can mean less downsizing for the same value – and can offer a more enjoyable retirement lifestyle to boot. Move an hour or two out of the more expensive regions, and you’ll be able to retire from that mortgage along with your job. Here’s a great article from MoneySense Magazine on the benefits of downsizing, with some ideas to help you determine if retiring mortgage free to small town Ontario is right for you. With this week’s second public meeting on Meaford Haven, it occurred to us that we’d never presented, in this blog, the letter of support we received from Shirley Keaveney, President of the Meaford and District Chamber of Commerce, last September – prior to the first public meeting. As we mentioned last week, Mike Hensel and his team presented a draft plan of subdivision on Monday. Speaking to Council and a full chamber of Meaford residents, he outlined the many improvements to the concept plan for this Ontario retirement community made since last September. At the meeting, a resident of the Ridge Creek subdivision presented some further requests for information, and the desire for phased constructions and new sidewalks within Ridge Creek. It looks like the Meaford Planning Department will be back with a report in July; Meaford Haven will be another step closer to realizing the vision of the Three-Seasons retirement community. When Meaford Haven introduced its unique Three-Seasons retirement community concept a little more than a year ago, it generated a lot of excitement among businesses and people in the community. The interest among retirees and soon-to-be-retirees has been even more intense. For the last 12 months, prospective residents have actively engaged in a series of virtual focus groups. They’ve provided input, ideas and advice on just about every aspect of the community, including community design, architecture (exterior looks and interior features), garden plots, parking, volunteerism, the design of the community centre, and the merits of a business club. But a few folks did share some concerns about the original draft concept plan. That plan diverted a watercourse that’s active a few months of the year so that it flowed into the main creek a little further upstream. Some nearby residents in the Ridge Creek subdivision wanted to retain the existing course. Meaford Haven will be an intrinsic part of the Meaford community; making our neighbours unhappy is the last thing we want to do. So our design team went back to the drawing board. For nearly six months, they worked on redesigning the Meaford Haven retirement community, working with a fluvial geomorphologist (try saying that fast three times), to allow for the northerly watercourse. The original plan took a lot of care to retain natural heritage, but during the revision, the planners also looked at ways to keep an even larger parcel of forest right in the middle of Meaford Haven. By moving the through road eastward, more of the forested area now remains undisturbed. The team has also surveyed all of the butternut trees on the property, including small saplings, and maintained setbacks to protect these trees. And a second road into the Ridge Creek subdivision to the east will diffuse traffic between Meaford Haven and downtown. This was a big investment and it took a lot of time. We’d apologize for the delays to those of you are eager to see things moving, and who have expressed such interest in and goodwill toward our unique retirement community. But we think the new plan was worth the effort and expense, and we’re more keen and determined than ever to make this smalltown Ontario retirement community a vital part of Meaford. Here’s your chance to learn more.. On Monday, May 14, Meaford Haven will bring the revised draft plan of subdivision to Meaford Council, and the public is invited to hear about the improvements and share their thoughts. 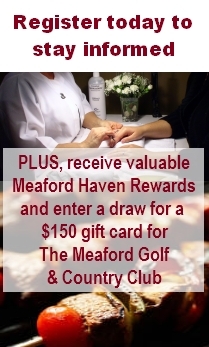 This is a great chance to ask any questions you might still have about Meaford Haven. It’s also a chance to let Meaford know your feelings about this unique community project. The public meeting starts at 5 p.m. at the Municipal Council Chambers on the 7th Line (#157859). Once the draft plan of subdivision is approved, we can move on to the next stage of creating Meaford Haven. We’re looking forward to it. It might be the fresh Georgian Bay air. 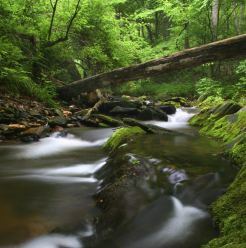 Or maybe it’s the huge choice of outdoor adventures and activities. Might even be the breathtaking scenery. But you can work up a healthy appetite here in Meaford Haven country, and fortunately there are a lot of local, fresh, homegrown food to be found. Meaford’s 100 Mile Market opened back in 2007, so we’re no strangers to the charms of the locavore lifestyle. And somehow, a healthy retirement lifestyle fits perfectly with the “eat local” ethos enjoyed in these parts. Here’s a tasty sample of local fare you can find within a short distance of Meaford. 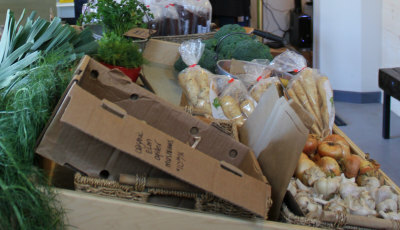 Organic produce grown in Meaford. Organic market garden veggies and berries. Berkshire pork products. Potted perennials, fresh herbs, butterfly attractors, tomato plants, gourds, squash. Grass-fed beef, grass-fed lamb, pastured pork, pastured poultry (chickens, turkeys, eggs), and a wide variety of organically grown vegetables. Twin Creeks considers their meat and produce “beyond organic” as they simulate the natural diversity in nature. Pork and open pastured beef and lamb fed on GMO-free feeds grown on the farm. Heritage methods, principles and results culminate in an artisanal meat like no other. 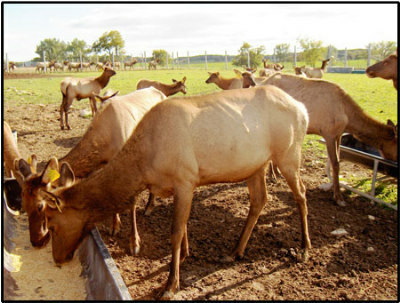 A selection of premium elk venison from farm-raised animals. No growth promoters and the Farm’s animals are raised on pasture in the summer and hay in the winter, supplemented at various times of the year with grains. Traditional dry, hard apple cider made from locally grown apples at popular cidery. Award winning winery is Grey County’s first, featuring such offerings as Bone Dry Riesling, Back From the Dead Red and Into the Light White. Unique syrup enhances drinks, teas and food – produced here in Meaford. A family owned and operated business. The apiary produces a delicate, light tasting wildflower honey and you’ll find a variety of honey products, as well as 100 percent beeswax candles and handcrafted designer soaps. Home grown and preserved pickles, beets and relishes. Maple syrup and maple products.